Discover just what the usual tuition is for American colleges, and how Boston College measures up. Knowing the fees and tuition related to going to Boston College will enable you to plan a budget for the next 4-6 years. Examine the data below to know how Boston College's price measures up to other schools and if you need to arrange for a rise in tuition. The next table shows how Boston College compares to other colleges nationally, regionally and by state. How Much Does Boston College Charge for Tuition? Full-time undergraduate students at Boston College were charged $53,346 in fees and tuition in the 2017 - 2018 academic year, before modifications for financial aid. $52,500 was the price of tuition. $846 was the cost of fees. Regrettably, this college doesn't provide any reductions to residents of the state. How much does Boston College cost part time? Discover Boston College cost per credit hour here. There continues to be a rise of 4.0% in Boston College fees and tuition for out-of-state students in the past five years. Tuition expanded by 4.0% and fees expanded by 2.4%. This school year, undergrads can anticipate paying $55,469 based on current estimates. Because of price growth, the total expense of a four-year degree from Boston College would be $235,478, and the total cost of a two-year degree would be $113,146, not including extra charges for books, transportation, and room and board. 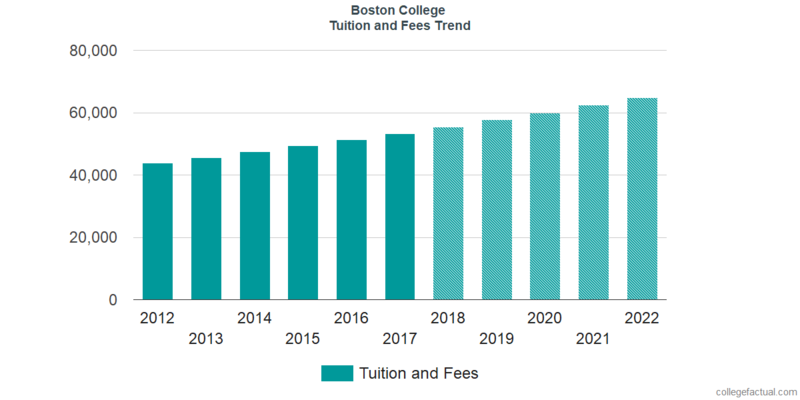 See predicted potential tuition and fees for Boston College students in the next chart. Mainly due to the cost of living as well as other factors, the cost of college tends to grow each year. For this reason your last year of school may very well be much more expensive than your initial year. Find our answers to common questions and get additional information about college tuition and fees.